From Apr. 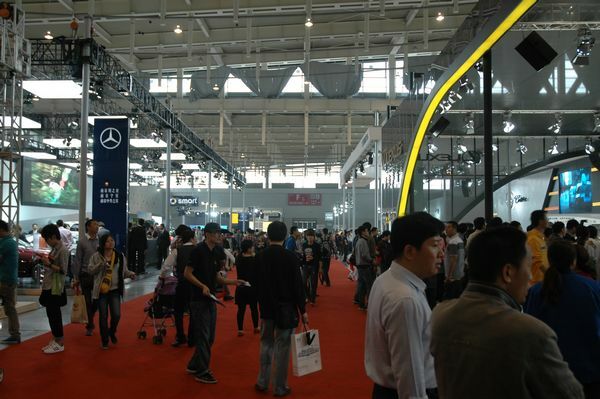 28th to May 2nd, the 5th Nanjing International Auto Expo held in Nanjing International Expo Center. Supported by China Machinery Industry Federation (CMIF), SINOMACH, this expo was hosted by Society of Automotive Engineers of China (SAE-China), China Automobile Dealers Association (CADA), CNAICO, Jiangsu Provincial Association of Machinery Industry (SUMIA) and undertook by Nanjing International Expo Center, Nanjing Guoji Exhibition and Convention Co., Ltd., CNAICO-BOLAN Nanjing Exhibition and Convention Co., Ltd. In the 70000m2 expo area, over 550 cars of 60 brands showed in this expo. More than 200 journalists and 220 thousand audience came to visit while as many as 2736 cars were sold, summing up 620 million RMB. The holding of this expo heated the auto market in Nanjing, forming a high-quality, beneficial and efficient auto marketing platforms for companies and consumers. The five-day Nanjing International Auto Expo concluded the three-day May Day Holiday, making the audience and customers enjoying the feast of auto. Audience are not only from Nanjing, but also from Zhenjiang, Changzhou, Wuxi, Yangzhou and even Anhui Province. And the Nanjing International Expo Center provided a very good infrastructure and transportation for the exhibitors and audience, which lightened the expo. What’s more, the exhibitors all displayed their best cars, arranged the best activities and provided the best discount, both exciting the audience and customers. More than 60 brands gathered in this expo, including the Rolls-Royce Phantom which was as much as 11 million and high cost-efficient Chinese cars which were widely welcome. For the luxury cars, the 11 million Rolls-Royce Phantom was the most expensive. Bentley, Aston Martin, Lamborghini, Ferrari, Maserati, ZOEMO all brought their mainstream models to the audience. In this expo, there were over 50 cars which were more than 1 million and over 15 which were more than 3 million. So many luxury cars gathered together, treat a feast for the auto fans and reflected the huge potential of the auto consuming of Nanjing. And for the new cars, 2012 DongFeng Citroen C5, 2012 Subaru XV, Roewe 950, Lexus RX350, Gleagle GX7, 2012 Benz Smart, Chery Cowin 5, Volvo V60 were all blinking in their own event. In the 5-day expo, 2736 cars had been sold, which was over 620 million RMB. During the expo, exhibition stands of all main brands were crowded with customers. Brands like Benz, BMW, Volvo, Lexus, Cadillac, Subaru, SGM, SVW, Skoda, FAW-Volkswagen, GAC-Toyota, DYK, Emgrand, Gleagle all said that the market share and growth rate of their brand in Nanjing pioneered the nation, so they all valued the market here, bringing the newest and best cats and the biggest discount. There were also many other activities in the expo, such as China Super Car Model Competition Nanjing Sub-Competition, photograph competition. All of these activities treated the audience and auto fans a entertaining and fashionable feast of auto. As the 4-year continuous development, Nanjing International Auto Expo strode very fast, becoming one of the most popular and attractive regional international auto exhibition in Eastern China. The successful held of the 5th Nanjing International Auto Expo, not only provided a very important platform for the companies to show their brands, but also inspired the auto market of Nanjing, satisfying the demands of consumers in Nanjing, helping the development of the auto market of Nanjing. We believed that with the quick development of the auto market, there would be more and more best brands showing in the expo, providing more discount for consumers and enriching the auto culture activities in Nanjing.